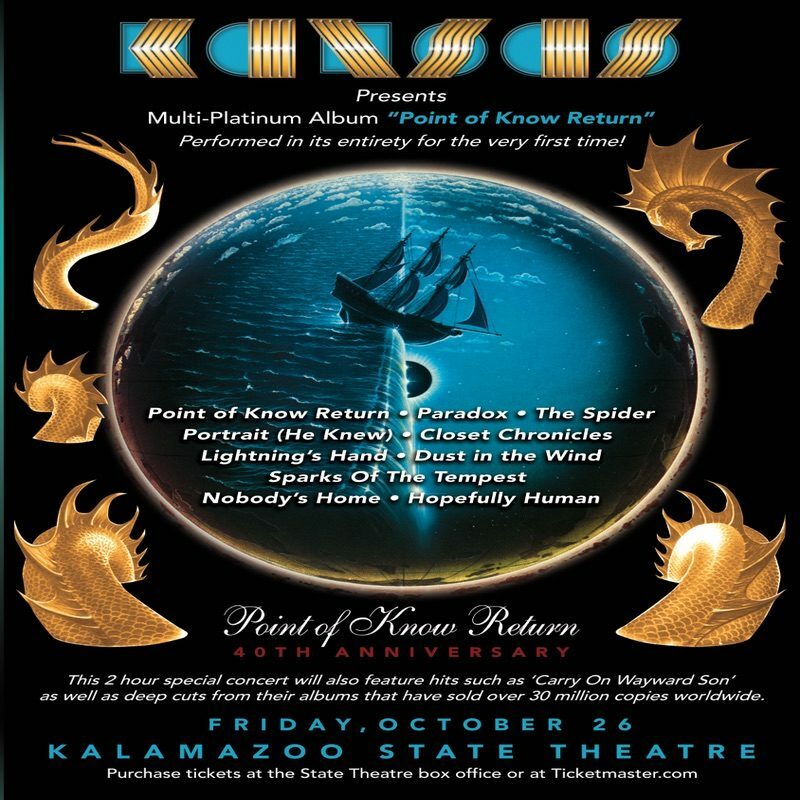 America’s preeminent progressive rock band, Kansas, will be making their way to Kalamazoo this fall celebrating the 40th anniversary of their massive hit album Point of Know Return. To celebrate, for the first time in history, the band will be performing the album in its entirety. The tour will showcase more than two hours of classic Kansas music including hit songs, deep cuts, and fan favorites. In 1977, Kansas followed up the success of Leftoverture by releasing the album Point of Know Return. Containing the smash hit and million-selling single “Dust in the Wind,” along with fan favorites such as “Portrait (He Knew),” “Closet Chronicles,” and “Paradox,” Point of Know Return became the band’s greatest selling album. The album peaked at #4 on Billboard’ Album charts, reached sextuple – platinum status with more than six million copies sold, and had three Billboard Hot 100 Singles. Don’t miss Kansas performing their classic hits, deep cuts, fan favorites, and Point of Know Return in its entirety LIVE at the Kalamazoo State Theatre, Friday, October 26th 2018. This is an all ages event with reserved seating. There is an 8 ticket limit. Tickets available starting 3/21 at 10am. VIP can be bought online only. There’s a 4 ticket limit. VIP will be available starting 3/20 at 10am. $259.50 – Wheat and Greet VIP1 package. Includes premium seating, meet & greet, & perks. $209.50 – Premium VIP2 seat package. Includes premium seating & perks.